Feb 3, 2013, 8:30 PM CST…Sadly still no change in the hostage situation. Apparently Dykes has decided to go the full distance. Kudos to the officials who are showing extreme patience and sensitivity for little Ethan’s safety in all this. As much as we would love to see an end to this, reality is different from the movies and a Rambo-style assault would definitely be unwise. We will continue to monitor all of this and report here anything we find out. My WTC column today gives an eyewitness account about heavy earth-moving equipment being transported to Midland City, AL, where 5-year-old Ethan is still being held hostage by Jimmy Lee Dykes. It should be noted that until yesterday everyone in the media, myself included, was giving the wrong name for the hostage-taker as Sykes. We have no confirmation that any of this equipment is heading toward the hostage site, but around here we don’t get a lot of military trucks carrying bulldozers on back roads. Here are some artist illustrations done for Headline News that can be found on their broadcast copied to YouTube. They give some idea of how Dykes built his bunker using a large shipping crate. It’s doubtful that the bunker itself is very professionally done, and conditions inside may be getting pretty uncomfortable. 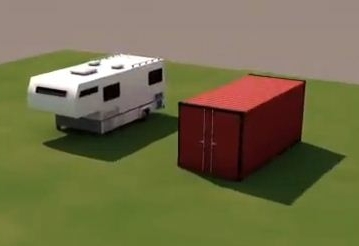 This first illustration shows how Dykes had a shipping crate near his trailer home on his property. There are few trees close by and the land is flat and open. He dug the hole himself. The actual bunker has been reported to be about 6×7 feet (floorspace) and about 8 feet high with cinder block steps into it. 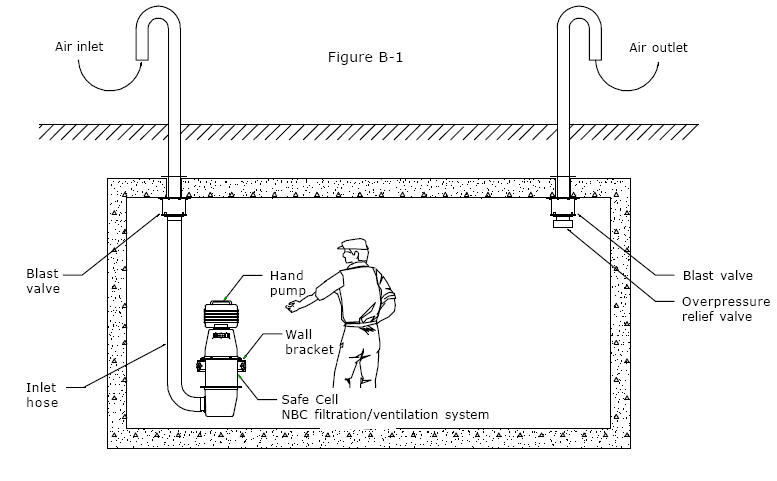 The next illustration gives some indication of what it may be like inside the bunker itself, and the third shows how he put an underground PVC pipe to the outside. That is the pipe authorities are using to talk to him and deliver medicine to the boy. The top of the bunker may be vulnerable and our eyewitness speculated that the bulldozers could be used to scrape off the top enough to insert troopers to rescue the boy. We will find out what they are planning as the weekend proceeds. It makes sense that any action would be done on a weekend when the surrounding area might have less traffic. The final two illustrations are simply pictures I pulled off the web. There is a lot of survivalist junk out there and apparently quite a few “preppers” love the idea of hiding in a rabbit hole waiting for the government to collapse. 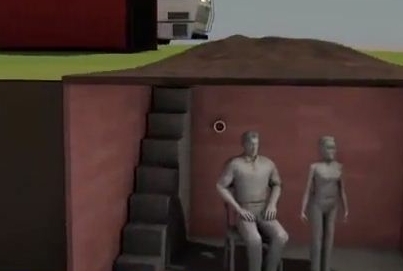 The black and white drawing is from an online instructional on how to build a bunker. The last one is from the 1950s. Anyone alive at that time would remember “fallout shelters” that were being built right and left in fear of a nuclear war. The fad stopped when it became clear that even underground shelters wouldn’t provide much protection from a real nuclear blast. Call me crazy but I am not enamored by the idea of hiding in a hole to survive. I honestly think I’d rather be part of the first wave to go if there is a huge disaster. Dykes told a neighbor he was building his bunker as a tornado cellar. If that was true why did he supposedly stock it with enough supplies to last a full month? Tornadoes come and go in mere minutes. Who knows what crazy people think. The only place he needs to be holed up is in an asylum, but unfortunately they have all been boarded up so nutcases can exercise their personal rights and take little kids hostage. This entry was posted on February 2, 2013, 6:26 pm and is filed under The Backstory. You can follow any responses to this entry through RSS 2.0. You can leave a response, or trackback from your own site. True that our insane asylums have been closed so liberals can feel good about themselves and our children can suffer the consequences.